Learning about the tale of the “Bête du Gévaudan” (Beast of the Gévaudan). Traverse the centuries of time and the borders of Europe on the medieval pilgrim trail of Compostela. In the 9th century, the tomb of the apostle St James was unearthed in Compostela. The site became the focus of a pilgrim trail beginning in France, and crossing northern Spain to Santiago de Compostela. This journey, along the Via Podiensis, the French Way of St James, takes pilgrims from Le Puy en Velay to the Pyrenees at St Jean Pied de Port. The route passes a multitude of churches and monasteries, resembling a travelling museum of Romanesque art. 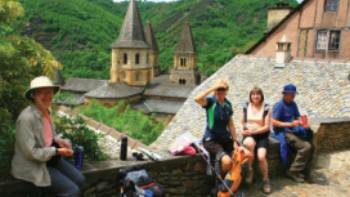 Seven stages of this historic trail are included in our self-guided walking program in France. This section begins in the centre of France, on the Central Massif at Le Puy-en Velay where many trails from across Europe converged en route to the tomb of St James in Spain. 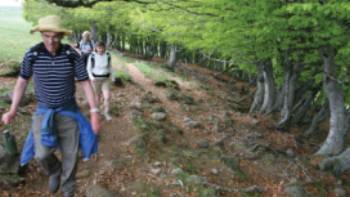 The trail ascends the volcanic highlands of Margeride in the Haute Loire before continuing through the traditional granite villages of the Lozere. Continuing through the Aveyron, the final destination is the enchanting town of Conques. The presence of stone chapels and the unique crosses are symbolic of the pilgrimage and a continual reminder of the religious significance of the trail, whilst the pretty villages, rolling countryside and strong gastronomic traditions make this one of the best walks in France. Daily walks are between 11 to 29km on well marked trails over diverse terrain – from relatively flat to mountainous. There are some reasonable hills and part of the route is on paved surfaces. This is a well worn path where route finding is straight forward (refer below for further details on self guided adventures). The main areas to concentrate on route finding are arriving and leaving towns. The accent is on keeping a steady pace to take in all of the attractions, with time to stop and take photos. You will need a good level of fitness to participate fully in this adventure. 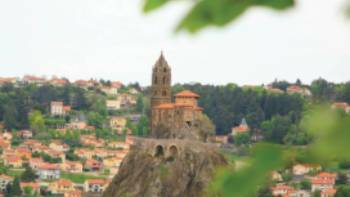 Arrive in historic Le Puy-en-Velay, a pilgrimage centre since the Middle Ages. This ancient town is surrounded by a volcanic landscape dominated by rocky peaks rising from the valley floor. We recommend that you allow at least half a day to explore its narrow streets and warm up your walking legs climbing the 267 steps to the Chapel of St Michael d'Aiguilhe. Built by Godescalc after his pilgrimage to Santiago in AD951, you'll have great views over the town and surrounding area. You can also visit some of the many museums and the striking Romanesque Cathedral of Notre-Dame. The cathedral at Le Puy is the starting point for your walk. As you follow the trail, there are great views over the whole area. Through rural landscapes you'll ascend rapidly from the Puy Basin. Crossing the Velay Mountains past fields of the famous green lentils, you enter the heart of the volcanic chain of the Deves before arriving in the small village of St Privat d’Allier, where you're picked up and taken to a gorgeous B&B in the valley with beautiful views. Most of the day is spent crossing the valley. You will pass through the village of Rochegude, famous for its St Jacques Chapel, where a descent to the river at Monistrol will follow. Whilst the trail is easy to follow, the following ascent is quite sustained (500m over 11km) just beyond Rognac from where the route leads you to the historic village of Saugues, famous for its mushrooms, wooden shoes and a meeting point for all pilgrims coming from the Auvergne. Today is very picturesque as you cross the Margeride Plateau. With vast grassy plains and moors of broom and heather, this part of the trail is relatively easy going - although gently ascending most of the day. Amongst the most interesting sights are St Roch Chapel or L’Hospitalet du Dauvage Chapel, founded in 1198 as a hospital for pilgrims and travellers. Overnight in St Alban/Les Faux (26km/16.1mi) or St Alban/Le Rouget (29km/18mi), dependent on availability. From Les Faux or Le Rouget the trail continues to the town of St Albans then descends into the Truyere valley. You then traverse the vast plain of the Margeride before reaching Aumont-Aubrac. On the way, admire the Roman church of the Estrets, reworked several times and surmounted by a bell tower wall with three openings supporting a small steeple. Set at 1043m, the town of Aumont-Aubrac is in the heart of Lozère and is an important point on The Way of St James. There is a statue here of the “Bête du Gévaudan” (Beast of the Gévaudan), the man-eating wolf-dog that terrorised the Lozère area in the late 1700s and as a werewolf has inspired literature and popular culture since the mid 1800s. From Aumont-Aubrac in “Terre de Peyre” (land of stone), the Way of St James crosses some beautiful pine forests before joining the Aubrac plateau, a vast expanse of pastures punctuated by “burons” (in the Auvergne region this is a shelter where the cowherd lives and makes cheese during the summer). Here you are in the country of the famous Laguiole knife, an indispensable tool to cut the cheese of the same name. Arrive at your hotel/guest house in Nasbinals or Recoules d'Aubrac. This stage takes you through the heart of the Aubrac plateau, where the ancestral rite of transhumance is still practiced (the transhumance fair is on the Sunday nearest 25th of May). At lunch time, you can try the regional specialties at a buron or country inn, where local dishes are available such as the “aligot” (mashed potato with cheese and garlic), assorted cooked meats from the mountain or a good crepe omelette. In Aubrac you can see remnants of an ancient “Domerie” (name given to the hospital in Aubrac in medieval times). Overnight hotel in St-Chely d'Aubrac. We leave the country of the “Boraldes” (name given to the brooks descending from the Aubrac) to reach the Lot valley. Here you are near St-Côme d’Olt, listed among the “most beautiful villages of France”. There are remnants of numerous bridges constructed over the Lot river which made the pilgrims' crossings easier. Overnight hotel in St-Come d'Olt or continue to Espalion, dependent on availability. Espalion's lovely old stone bridge is listed as a UNESCO World Heritage Site. The walk continues on the Way of St James following the stream of the Lot river to the lovely village of Estaing, with its Gothic bridge and imposing chateau. The annual St Fleuret fair has been held here since the 14th century (on the first Sunday of July). On this occasion, a great procession travels through the village in period costume. Overnight hotel in Estaing. We leave the Lot valley at the village of Golinhac, remarkable for its church. The church preserves the Roman foundations of a Benedictine priory, which was dependent on Conques abbey. At the entrance of the village of Golinhac, there is a stony cross with a small sculpted pilgrim erected on it. 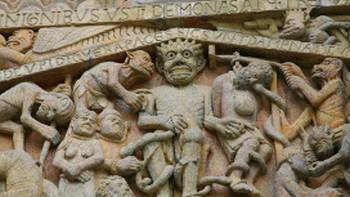 In Espeyrac in 960, according to the tale, a pilgrim who became blind after a mugging, recovered sight by making an invocation to the patron saint of Conques. Overnight hotel in Golinhac. The walk to Conques is very often one of the favourite stages for pilgrims as the view over the village is breathtaking if you come from the east. While descending into the deep valley of the Ouche, you will arrive near the Dourdou river (which flows into the Lot river, to the north) and discover this village with pointed roofs over which the towers of the Romanesque Abbey-Chruch Sainte Foy dominate. You can also admire the village's portal, a real treasure from Roman times. Relax in one of the many bars to experience the atmosphere of this lovely town. 11 breakfasts, 10 dinners (no dinner in Le Puy en Velay): Breakfasts are usually continental inclusive of breads, cheese, ham, tea, coffee & juices. Dinner will consist of 2-3 courses, usually starting with a salad, followed by a chicken, red meat, fish or pasta dish & finishing with a dessert of fruit or cakes or cheese. 11 nights in guesthouses or simple hotels on a twin share basis, generally with ensuite facilities. On occasion facilities will be shared with one or two other rooms. Option to upgrade to comfort plus accommodation - supplement applies. Excess baggage - arrangements can be made to carry baggage in excess of the 1 bag of 15kgs limit. Excess baggage which has not been pre organised may be refused. A supplement applies for excess baggage. Please ask our office for details. For start dates on Fridays and Saturdays, dinner will not be at the hotel restaurant in Saugues, as it is closed on Sunday and Monday evenings. Instead, dinner will be at a local restaurant.